"Two months ago we announced our pricing changes in our "it's still business, but let's keep it reasonable" disclaimer, and we listened to all kind of reactions. Some guys from the audio/plug-in industry might have said that we're naïve or anti-corporate, while the music press has warmly reacted and dozens of individual music producers have written to us to comment on how much they share the same point of view about it all. No need to say that, among the industry, the press and music producers, we'll mostly listen to - and work for - the latter. We love music and music making, and will always do our part to support the scene. 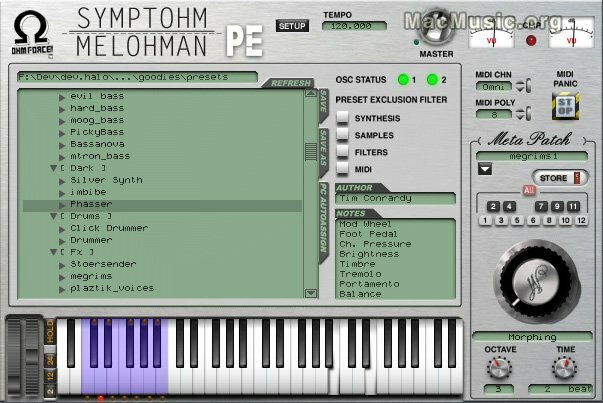 The pricing changes were only the beginning: from today, we invite all music producers in the world to download and use for free the Performer Edition of our Symptohm:Melohman powersynth. That's it: Symptohm:Melohman is now freeware, joining our rock solid stinky Frohmage filter. That's our Christmas gift for the music production scene. Exploring new sounds is priceless! And when we say priceless, we really mean it :-)"
This great virtual synth is available now for free in VST, AU and RTAS formats for both Mac and PC.